The horrendous sin of taking people against their will and forcing them to work has been practiced for thousands, even those by societies claiming to be civilized, with a despicable legacy today. The Atlantic slave trade started in 1501, when the first African slaves arrived in North America, since then approximately 15 to 18 million Africans are believed to have been enslaved. Of that, approximately 400,000 crossed the Atlantic to the United States of America against their own free will. The economic system of slavery was so inherent to the “free world’s” culture scenes of slavery were even depicted on monetary notes. This nation was built upon the backs of Africans through a brutal system of inhumane labor separating families and transforming cultures. Slavery officially ended on December 6, 1865 with the ratification of the 13th Amendment, however, abolition gave way to systemic racial tensions throughout the country. Discrimination against freed slaves continued and social attitudes of white supremacy and Jim Crow legislation prompted thousands to flee to the barrier islands from Florida to North Carolina, joining the thousands of already freed slaves living there. Forming communities closely tied to the land, the Gullah and Geechee peoples cultivated their West African heritage blending new traditions and social practices absorbed during their enslavement. 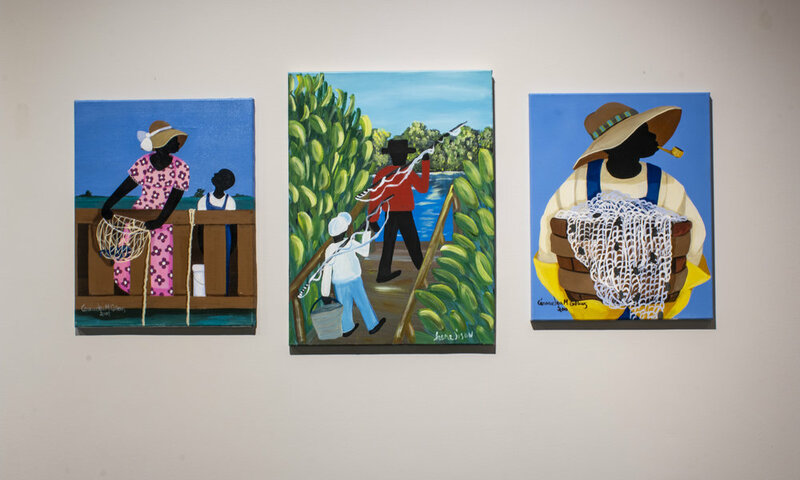 Due to their economic and geographical isolation, the Gullah and Geechee’s way of life and artistic practices have remained intact for 150 years. 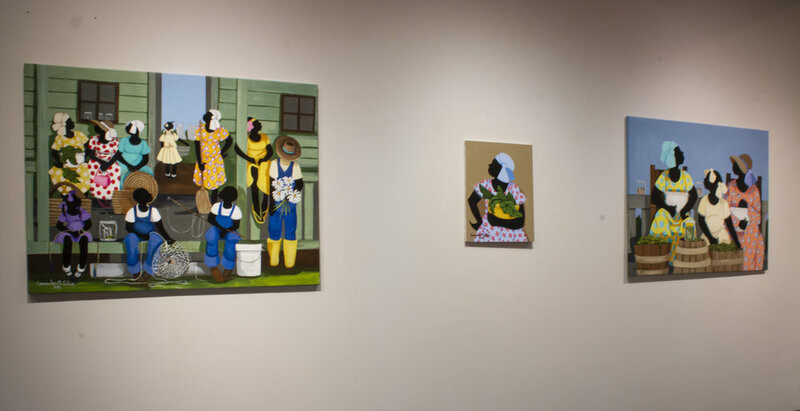 The artists shown here draw on their strong Gullah Geechee history depicting the life and heritage of their people. Tison and Gillens use bold colors for large close-up paintings inspired by real life scenes either passed down in verbal tradition from generation to generation or experienced first-hand by the artist themselves. They show the struggles of their ancestors and African Americans today while celebrating their culture and way of life. 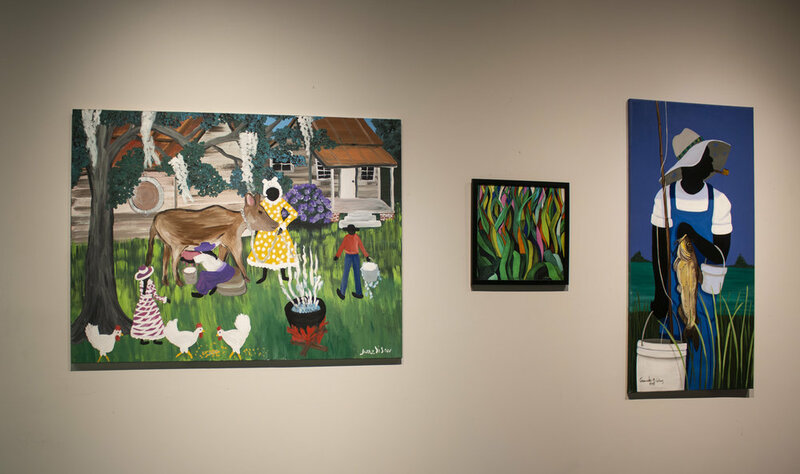 Works from the Jonathan Green Collection are inspired by the artist’s vibrant paintings of lowcountry landscapes and Gullah culture. The Inspirations series is based on Green’s costume designs for the 2016 Spoleto production of Porgy and Bess. The Firegrass pocket square draws on coastal marsh landscapes. White Breeze is from a painting series in which Green highlights African Gullah women. John W. Jones meticulously draws each painting first then layers it with color, resulting in very realistic interpretations of everyday life and landscapes, as well as historical insights into our past. Jones’ works show the struggles that African Americans endured during slavery while attempting to bring humanity to the subject. Tison and Gillens work give insight into the powerful, overcoming spirit of the people that were falsely depicted on those bank notes and their beautiful. The memories that they depict of their families, the culture and traditions from their childhood, “show a resilient and determined character that allowed them carry on the qualities they brought with them from Africa in the form of music, religion, storytelling, art, architecture, agriculture, and culinary traditions” according to Jones.